Kimberly has been ranked as a leading business lawyer by Chambers USA since 2007. Clients interviewed by Chambers applaud her for understanding "not only the law itself, but also how individual federal, state and local agencies apply it in practice." In 2013 she was praised again by Chambers for her "fine technical background." Kimberly Hoffman uses her twenty-plus years of experience to serve as lead counsel in real estate, healthcare and government relations matters. She has assisted clients with strategic planning, legislation, documentation, and formal proceedings before courts, federal, state, and local agencies, including Congress. 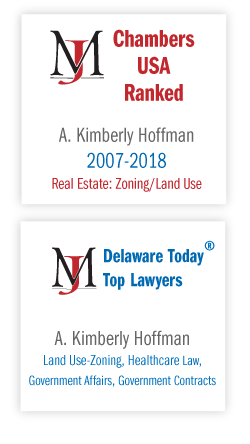 She is the only Delaware attorney recognized as a Top Lawyer by Delaware Today in the areas of both Zoning and Healthcare law. Kimberly represents a diverse group of businesses and high-net worth individuals, including publicly traded companies, physician groups, health care IT providers, developers and construction companies, schools, telecommunications carriers, banks, churches, and investors. She project manages multifaceted legal matters including the transaction, government approvals and related litigation, including acquisition, financing, leasing, licensure and procurement, often acting as lead or local counsel in multi-state transactions. In addition to her front-end loan work for lenders, in the workout context, she advises on environmental issues, zoning permits and approvals during property disposition, and in pursuing foreclosure and similar remedies. Kimberly chairs the firm’s land use practice, heads the multi-disciplinary Morris James Healthcare Team, and edits the team's blog, delawarehealthcareindustryblog.com. Chambers USA - America’s Leading Lawyers for Business has recognized Kimberly as a notable practitioner every year since 2007, noting in its commentary based on client interviews, that Kimberly "is extremely responsive, day and night," is described as a "top person" for land use regulation and zoning matters,” and "commended by clients for her ability in complex zoning law issues." Clients applaud her for understanding "not only the law itself, but also how individual federal, state and local agencies apply it in practice." Clients also recognize her "fine technical background and her expertise in complex zoning issues." Will Delaware Healthcare Exchange Marketplace Follow CA and NY? Partner Kimberly Hoffman is a Panelist for NBI Seminar, "Practical Guide to Zoning and Land Use Law"
Chambers USA, Recognized for Real Estate: Zoning/Land Use, 2007 - 2018. Recognized as "extremely responsive, day and night," and is described as a "top person" for land use regulation and zoning matters. Named as one of "America's Notable Lawyers in Land Use and Zoning"